Long Beach. I had no idea what to expect. 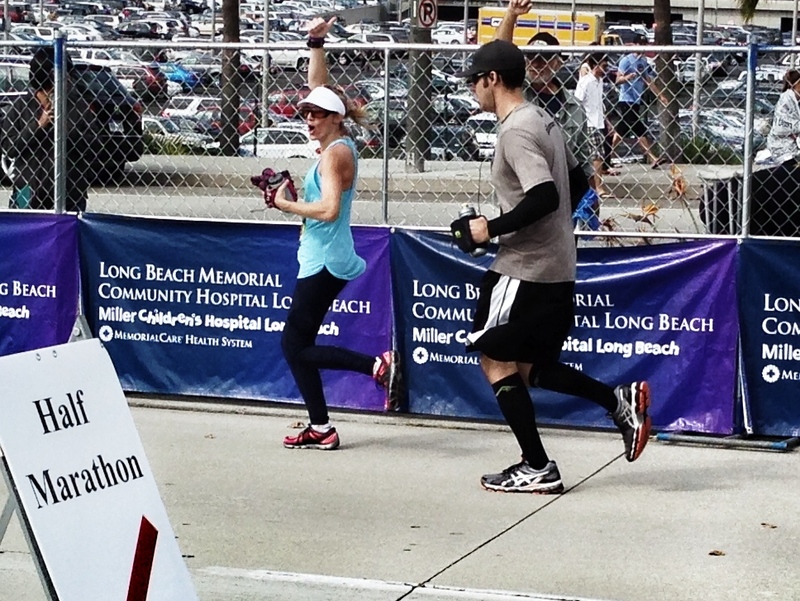 It was my brother’s first marathon and I knew that no matter what we were getting across that finish line. 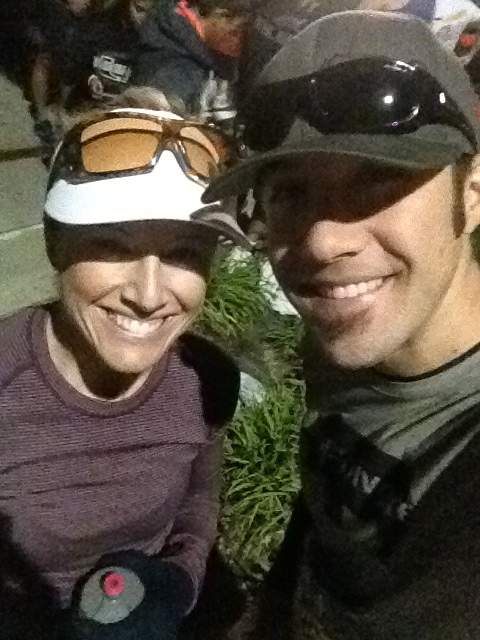 Since we were staying at different hotels I sent Joe a text to let him know I was on my way to the start around 5 a.m. We decided to meet at the portapotties since it was well lit and made it easy for one last bathroom break. 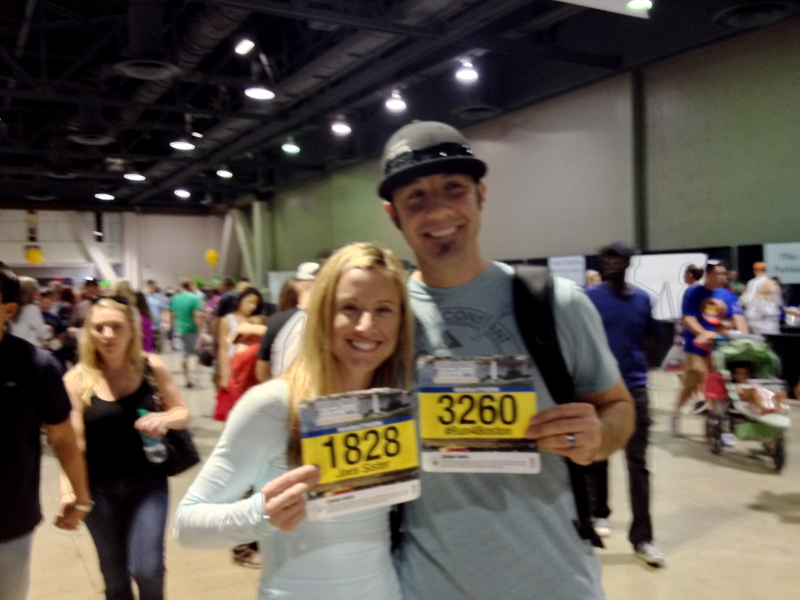 We made our way down to the start and shoved out way into the crowd right behind the 4 hour pacer. I figured that would force us out slow so that I could try to help keep an even split (goal) and if Joe had anything left in the tank we could try to pick it up at the end. A few minutes before the gun went off I got to meet Sandy. We have been at so many of the same races and always miss one another. Really cool that we found one another in the dark in a large crowd! Gun went off and away we went. Goal was to go out nice and easy and then get comfortable around 8:50-9:00 pace. Based on Joe’s training runs I knew that would be a great pace and it could mean a finish right around that 4 hour mark. The weather was abso-freaking-lutely perfect and we tried to get into a groove pretty quickly. As we past the 10k mark we celebrated being 25% done. We were right alongside the water and it was nice and flat. Beings that there is no such thing as flat in my hood this was a sweet change! We crossed the half way point under 2 hours and at that point it was looking like we had a solid chance of staying on track for that 4 hour finish. I remember we high fived and just kept chugging along. I remember Joe telling me he needed the bathroom but when we passed the portapotties there was a long line. I knew he didn’t want to stop and wait as that could be a recipe for disaster. I think it was at 15 that he finally got to go to the bathroom? I just remember taking his water bottle to fill it up and then we continued on. At mile 18 is when things took a turn. I knew we had been slowing down so I went into motivational coach/cheerleader. Seeing my sweet, hard working brother hit the wall was one of the hardest things I have ever gone through. I felt helpless as we rode the roller coaster of emotions. There was nothing I could do or say to make it better but I just kept trying. We decided together to move onto a 5:1 plan to try to help get through. Run 5 minutes, fast walk a minute and transition back to running. Around 20 I started to use my talk to text on my Iphone to let the family know where we were and how we were doing. I’ll give Siri some credit for doing a decent job of getting it right. Seriously, I talk to text messages to my best friend A LOT and Siri royally jacks them up. Around 22ish there was a group of boyscouts handing out otter pops. We hoarded them! Every race should have otter pops. I’m serious. I think we talked about how good those otter pops tasted for the rest of the race. There was a hill at this mile and we ended up in a sea of walkers. Hills in the late miles can be soul crushing. I wasn’t going to let the hills destroy our race. We went into run the flat walk the hills mode and it worked. Well, worked as well as it could, right Joe?! 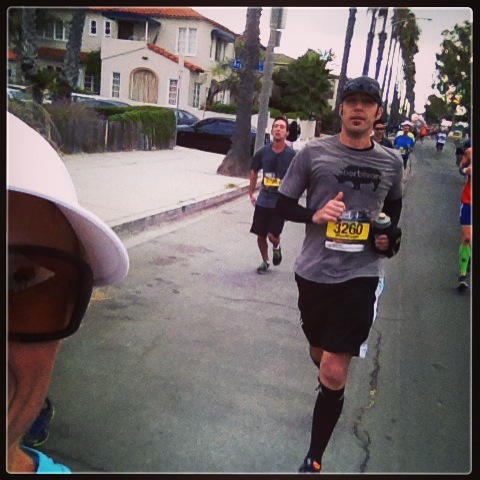 The last few miles of a marathon are always hard. Always. I think these miles were especially hard because Joe wanted his legs to go so badly but the mental battle makes it tough. More than once we held hands as I told him we were almost there. He was almost done. He was going to be a marathoner! 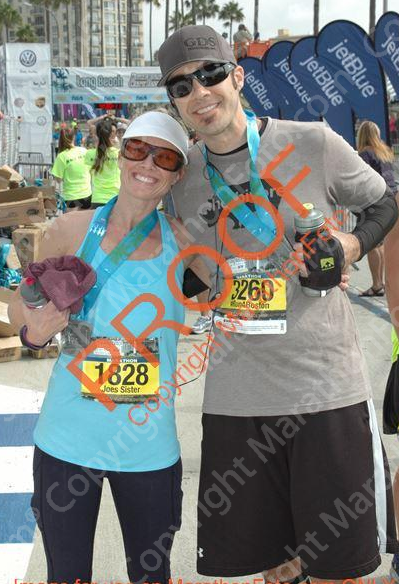 We crossed the finish line together in 4:28. Joe did it. 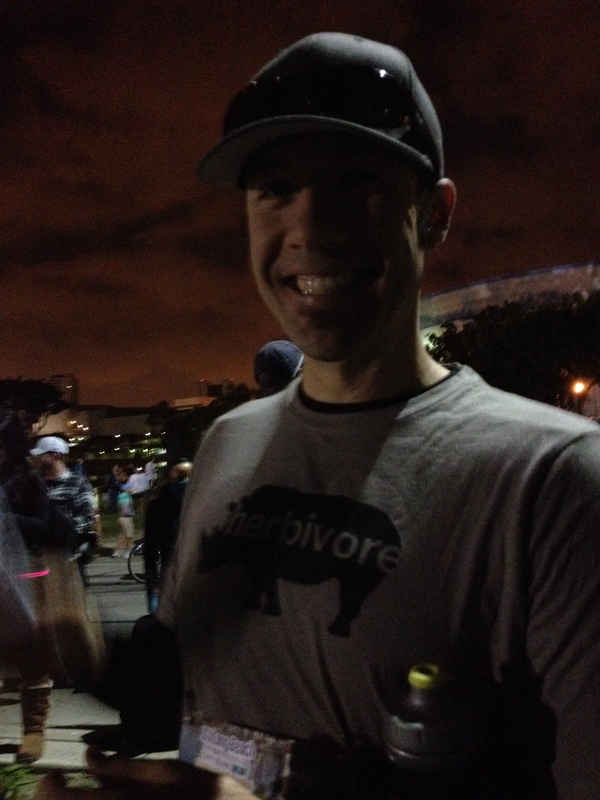 He battled through all 26.2. We hugged and cried and took pictures. 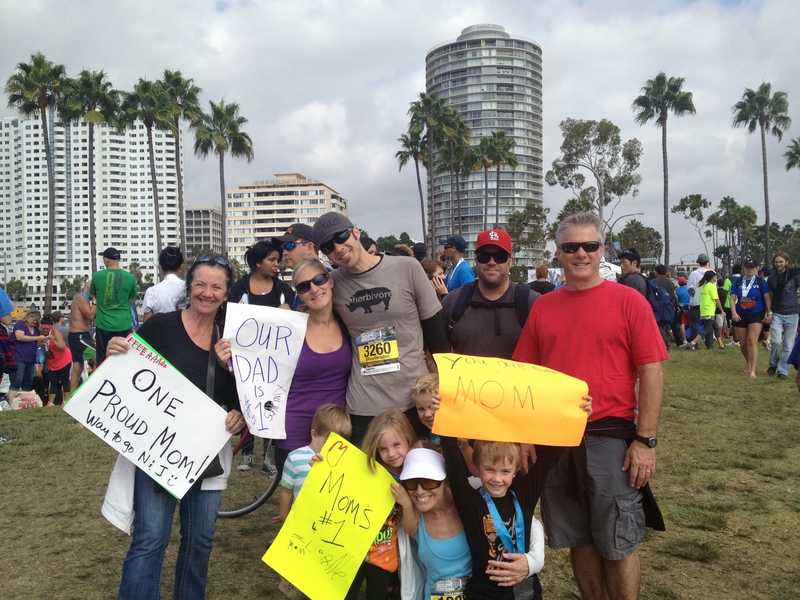 We reunited with the family and celebrated a finish that was 24 weeks in the making. My brother hated running. Loathed it. And now he is a marathoner. All it took was a little courage- and believing that there is so much more after that first step. Now it’s time to gear up for Boston training. I.can’t.wait. Awww this made me tear up. That’s so freaking cool that y’all did this together! You are a great sister!! That’s lovely you helped your brother. At the end of the day, it’s their personal battle when things start to slip and they hit a wall and you just have to let them mentally fight it out and support them where you can (exactly like you did). Great sister 😀 I’ve helped pace my husband and it’s a tough task as you don’t want to be too upbeat and chatty as it can irk them. It’s a tough one! It is tough. You are right, it’s letting them battle and break through. I told him to hit me if my inner cheerleader became too much. Thankfully I survived lol! It was great to meet you! 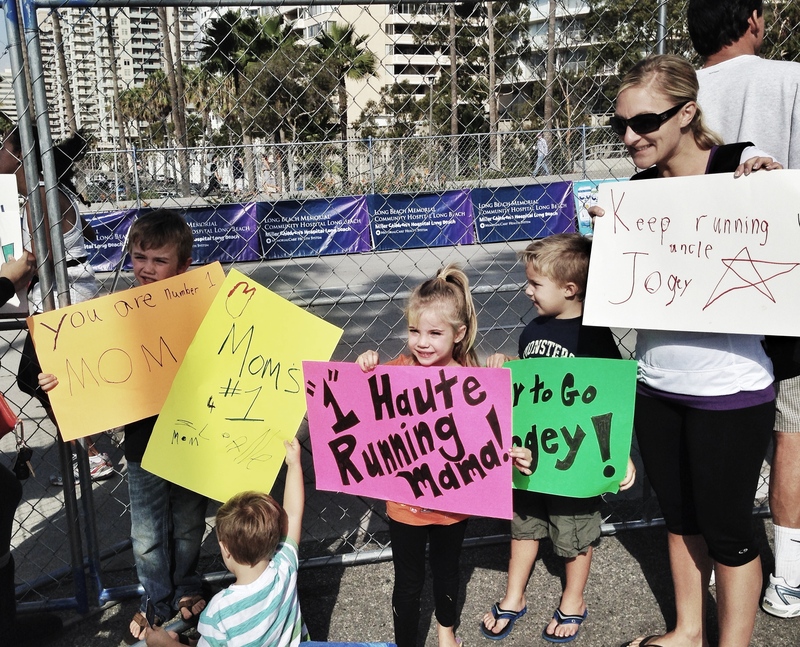 Congratulations to your brother for completing his first marathon! he did great! 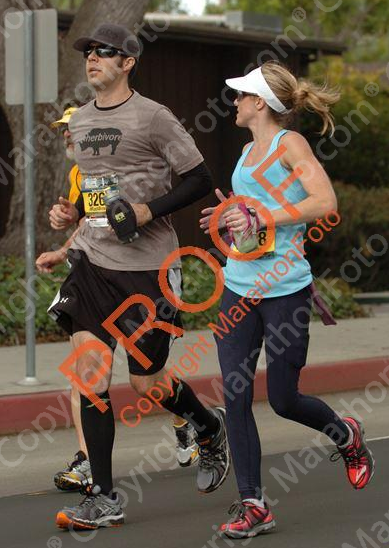 I love the picture of you two coming into the Finish! Have fun training for Boston! It was so great to finally meet you! You looked so strong at the half way point. Congrats on a great finish! Awe!!! 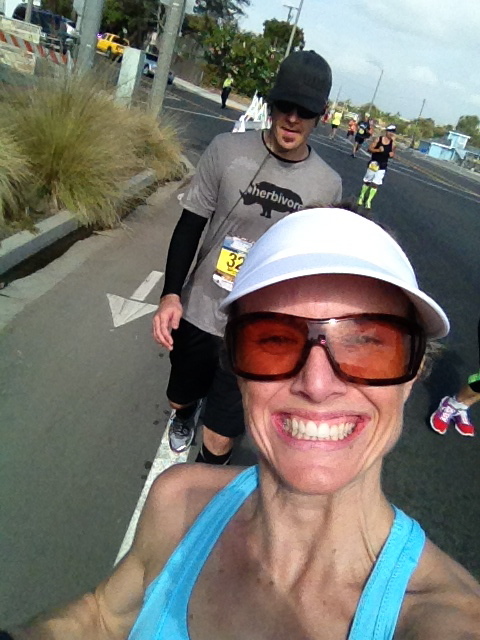 That is so awesome, I just ran a half in Saturday with my SIL’s and had a similar experinece(it was there first). So exciting, way to go joe!! Congrats to you and your SIL!! That is awesome! Ahhhhhh! Totally teary-eyed right now! What a beautiful day for you and your family! Such a different race experience. So fun and rewarding. Loved every moment- even the tough ones! Yay!! I totally got teary eyed. When do you plan to start your Boston training? I am starting January 1st. I will probably start in Jan too. I am running a half on 12/29 so after that it will be all business. Eeeeek! That’s FANTASTIC!!! That’s an incredible time for his first marathon. My first marathon was 4:59:58. I thought so too! You know how tough those last miles can be and I remember chanting sub 4:30 as we got close and thinking it was an awesome time. I think he is still pretty pumped! Those last miles were a beast!! Thank you so much. We will never forget this race! You and Joe are very blessed to have each other! I’m so proud of you Joe, you did GREAT!! Man I wish I lived closer. Miss you!! I have been looking forward to this post!! I was so happy to read about you and joe! You are a great awesome sister! What a great experience for you two, you both are lucky to have each other! I felt like I was there with you guys on the marathon, you are a great writer. Good job joe!! !